It’s a shame samurai warriors don’t walk the streets of Japan anymore. But the traditional fare they once consumed still survives today, embraced and perpetuated by the world’s foodies. In the thriving CBD of Guangzhou, we’ve reviewed the renowned Inakaya, an expert in robatayaki cuisine. Now, the latest Japanese establishment to settle into Zhujiang New Town is Zenho Sushi House. 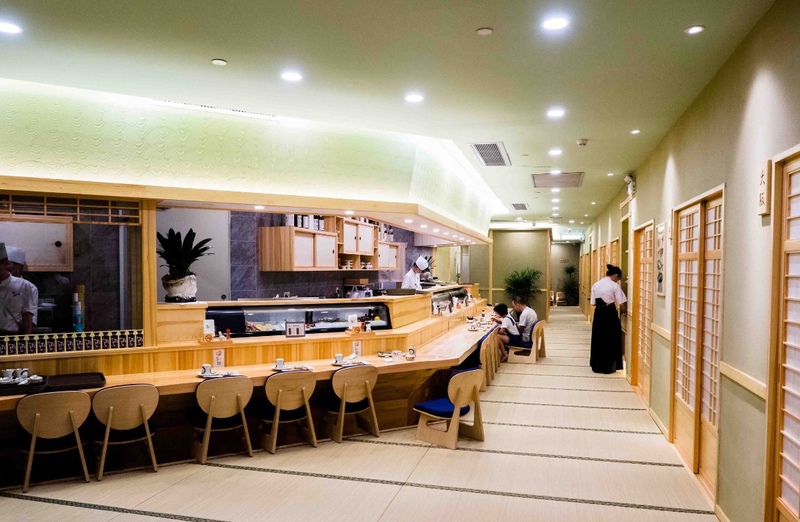 Located in the immediate vicinity of Tangcun Metro Station, Zenho is housed in a preprocessing space on the second floor of an office building, with a pristine wooden facade on the first floor where a receptionist greets patrons with “Zenho e yokoso!” (Welcome to Zenho). Boasting almost 20 private rooms and a long bar capable of seating 20 diners, the restaurant bustles with waitresses balancing bowls of sashimi and plates of tempura shrimp on a Monday evening around 7 o’clock. Reservations are recommended now, three months into operation, because the space has become popular among white-collar workers in nearby offices. Zenho’s menu features a set meal recommended by the chef (RMB500/800) comprising sashimi, sushi, soup, salad, grilled meat and king crab. What’s in demand here is the sashimi platter (RMB238/468), in which the prime cuts of mackerel and bream are ethereal. From tempura to sushi, nabemono (hot pot) to sashimi rice bowls and wagyu beef to the highly acclaimed kinki fish from Hokkaido, Zenho has it all. After raw fish, sampling the assorted grilled sushi (RMB120), which includes unagi, salmon, foie gras and flatfish sushi, is a tactful move. This plate of grilled seafood is paired to perfection with the sticky rice, whereas the foie gras revolted us with its metallic taste. Savoring the broiled mackerel (RMB50), however, makes up for it. Served with cherry tomatoes and mashed daikon, the fish is broiled till a nice shade of charcoal appears, which gives the skin a crispy mouthfeel, its texture soft and melty. Zenho spares no effort in bringing Japan to its patrons: each room is named after either a Japanese city or region. Here, Chinese chefs signal the completion of dishes in Japanese. Dining at the bar while waitresses shuffle to and fro behind us carrying hefty bowls of sashimi and ice proves quite distracting. Unlike most Chinese restaurants, though, Zenho does not enforce any minimum expenditure to dine in private rooms. So take off your shoes (as is required) and prepare to eat like the Japanese do! See listing for Zenho Sushi House. A brief look at the bars and restaurants we featured in our March 2019 issue​! Here's a list of the ones from 2018 we liked the best, taking into account everything from service to sauce. We've rounded up our picks for the greatest new restaurants in town. A brief look at the new bar and restaurant openings we featured in our August 2018 issue​! A brief look at the bars and restaurants we featured in our December 2018 issue​! The restaurant's chef always prepares his edibles using traditional methods and he never, ever compromises to local flavor preferences. Hankering for some slurpable noodles? Check out these tasty ramen shops sprinkled around Canton.